The unit's front panel offers easily accessible controls for the on/off switch and cappuccino system, as well as for adjusting the quantity of water and coffee to suit individual tastes, from long or short to weak or strong. Its patented cappuccino system rotates 180 degrees to allow for any size milk container, plus the coffee spigot height can be adjusted to accommodate all different cup sizes--from a classic espresso cup to a tall mug. Even more, the unit’s exclusive cup tray keeps cups warm before use, and its three-hour automatic shutoff provides added safety. Other highlights include a 60-ounce removable water tank, a handy water-level indicator, a 7-ounce bean container, an electronic steam and coffee thermostat, rinse and decalcification auto programs, and a removable drip tray for easy cleanup. 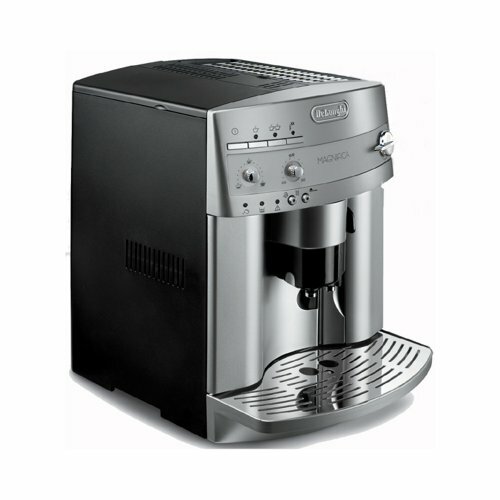 Made in Italy, the 1,150-watt espresso/coffee machine measures 17 by 13 by 18 inches and carries a one-year limited warranty. The machine's patented cappuccino system rotates 180 degrees to allow for any size milk container, while its coffee spigot height can be adjusted to allow for all different cup sizes--from a classic espresso cup to a tall mug. The unit features an exclusive cup tray to keeps cups warm before use, as well as a three-hour automatic shutoff for safety. For added convenience the unit comes with a water-level indicator, an electronic steam and coffee thermostat, rinse and decalcification auto programs, and a removable drip tray for easy cleanup. Made in Italy, this 1,150-watt espresso/coffee machine measures 17 by 13 by 18 inches. The Magnifica features the smallest removable brewing system available on the market. Because DeLonghi’s patented boiler is so compact, the excellent heat distribution guarantees a perfect espresso at the ideal temperature every time. And, thanks to the removable boiler, cleaning the inside of the machine is easy. Even areas normally difficult to reach can be easily cleaned and without the use of harsh detergents. 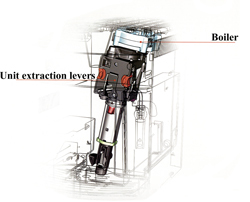 And because regular maintenance helps prolong the life of the machine, DeLonghi’s reliability is second to none. Coffee Spigots: Magnifica’s coffee spigot height can be adjusted to allow for all different cup sizes--from a classic espresso cup to a tall mug.